The world's top independent evaluator of mergers says shareholders should vote for the Tesla and SolarCity deal. Here's what investors should know. One of the biggest obstacles Tesla Motors (NASDAQ:TSLA) and SolarCity (NASDAQ:SCTY.DL) had left for the finalization of their proposed merger was a nod from Institutional Shareholder Services (ISS). ISS' recommendation, which has historically played a critical role in whether mutual funds vote for or against proposed mergers, was important for this merger's success. Tesla's vision for a sustainable future: fully electric cars, solar roof tiles and energy storage. Image source: Tesla Motors. Now ISS' recommendation is out and the independent advisory firm approves the deal, Bloomberg reported Friday morning. "The transaction is a necessary step toward Tesla's goal of being an integrated sustainable energy company," ISS said, along with some other notable comments about the deal. ISS also acknowledged the exceptional price Tesla is paying for SolarCity, saying "it appears reasonable to assume that TSLA is paying a low to no premium to take over SCTY." 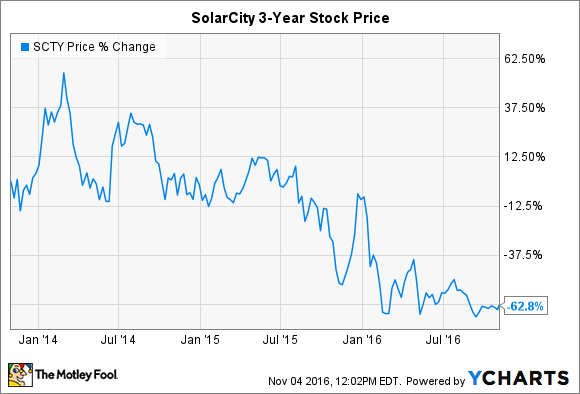 Tesla is buying SolarCity at a significant discount to the levels the solar company has traded at historically, with shares down 62.8% during the last three years. ISS' report, however, wasn't free of criticism. The advisory firm said Tesla has a "suboptimal governance structure," but also noted that the company mitigated any negative impacts of this structure by requiring a majority of unrelated shareholders to approve the merger. ISS is widely regarded the world's top independent evaluator. Research has shown a negative recommendation from the firm can "shift the vote as much as 20 percent," according to The New York Times. We very much appreciate that Institutional Shareholder Services (ISS), following an in-depth examination of both companies, recommends in favor of Tesla's acquisition of SolarCity. The combined company will become the world's only integrated sustainable energy company, ranging from clean energy generation to storage to transportation, resulting in a better outcome for shareholders, customers and the environment. Oct. 16: Tesla announced a collaboration with Panasonic to collaborate on photovoltaic cell and module production at SolarCity's Buffalo, New York, factory. Oct. 28: Tesla unveiled solar roof tiles designed in collaboration with SolarCity. Tesla solar roof tiles. Image source: Tesla. Nov. 1: Tesla released more details on its financial expectations for the merger. While ISS' support suggests a Tesla and SolarCity merger is likely, the two companies will still need to tally shareholder votes for and against the deal. Proxy materials have already been mailed to shareholders of both companies and the vote is set to take place on Nov. 17. Meanwhile, SolarCity shares are up about 10.5% at the time of this writing on Friday as investors appear to believe the deal is all but certain. With shares now trading at $20.50, the stock is only trading at about a 2.8% discount to the price Tesla would be paying for the solar company. If the deal goes through, SolarCity shareholders will get approximately 0.11 Tesla shares for every SolarCity share they own.